Anticipate potential volatility and get indicators that your release may be at risk. Showcase your organization’s GitHub usage and highlight patterns in user behavior. See where your organization’s intellectual property resides and who has access. 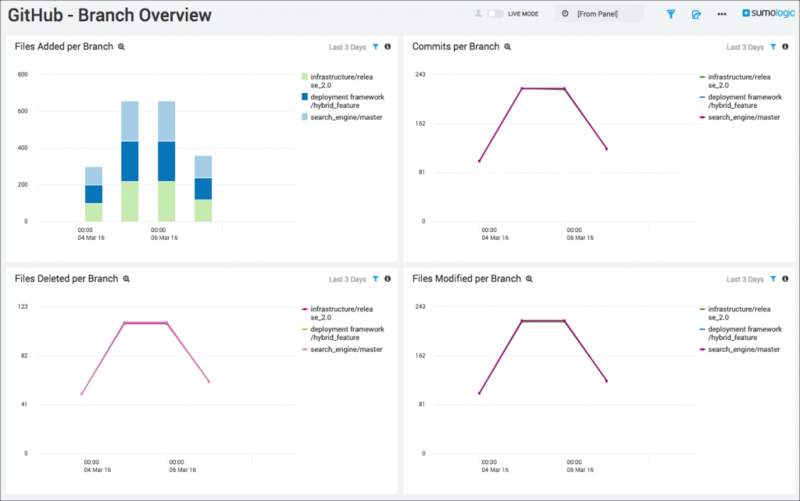 With the Sumo Logic App for GitHub, release managers can use predefined dashboards to gauge the health of their releases and anticipate any potential volatility or risk. Large volume of files committed, lines changed just before a release. Large number of PRs opened and left unattended right before a release. Large number of reopened issues. Significant changes in the branches of specific projects. 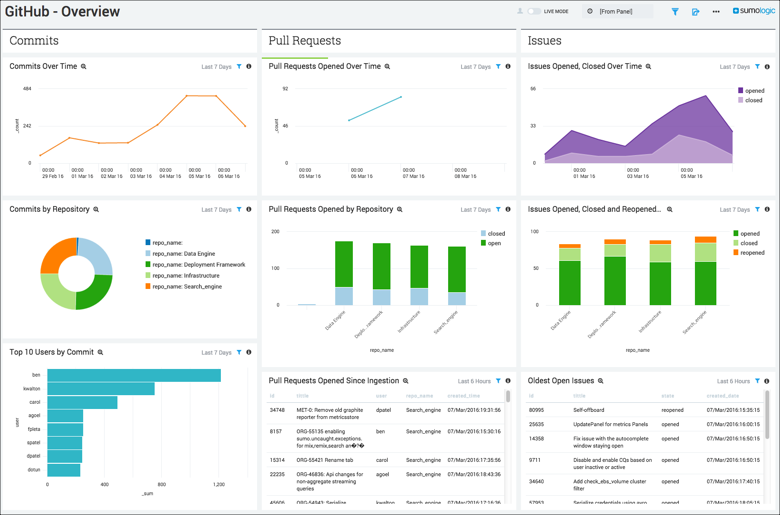 With automated alerts and premade dashboards, you can set up GitHub connections and start monitoring releases in minutes. 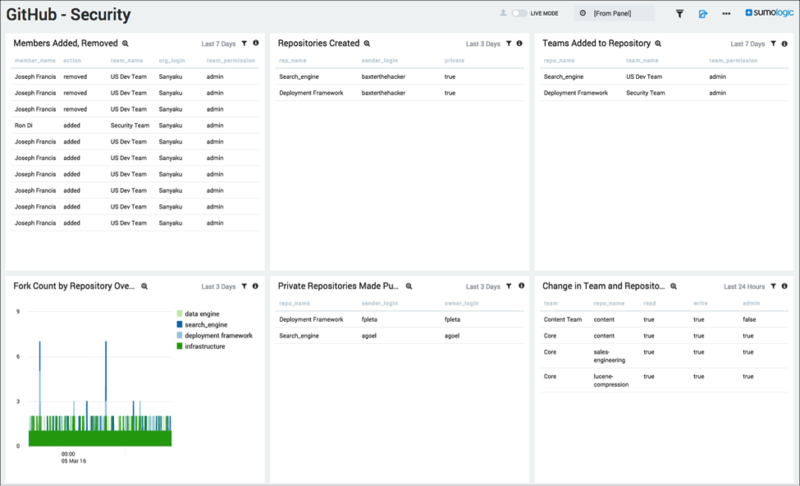 Sumo Logic translates massive amounts of log data and GitHub events into bite-sized, actionable insights that inform your releases. Gain real-time continuous intelligence from development to production. Get started today with Sumo Logic Free! Centralized dashboards and real-time visibility give you a single source of truth when it comes to your GitHub activity and release health. The Sumo Logic App for GitHub connects to the GitHub repository at the Organization or Repository level. GitHub events are pulled into Sumo Logic via webhook, and the data is filtered into dashboards that help you understand your GitHub branches, issues, pull requests, activity, and security events. Statistics and events are gathered from the GitHub Remote API on each host. Sumo Logic pulls in all GitHub events, and the following events are automatically pulled into dashboards: Fork, Issues, Membership, Public, Pull, Pull_request, Push, Repository, Team_add. Visit the Sumo Logic Help site to learn how to install the GitHub app and see your dashboards. With the Sumo Logic App for GitHub, you can prioritize high-impact events with automated reporting. Use our webhook connections to “subscribe” to particular events and get an HTTP POST response (or a “payload,” in GitHub’s terms”) when that event occurs. If you prefer, you can create webhooks with the GitHub API using POST requests. With seamless webhook connections, you can monitor your repositories—or any public repositories—with automatically generated alerts. Keep in mind that there are limits on webhook connections; you can configure a maximum of 20 events per GitHub organization or repository. The Sumo Logic App for GitHub also gives you powerful productivity tracking tools. You can define a team’s or individual’s productivity, then view productivity indicators with prebuilt dashboards. Filter the dashboards by team or by individual and track progress over time to see how your productivity is changing. Number of commits, pull requests, issues. Sign up for a free 30-day trial of the full Sumo Logic experience! 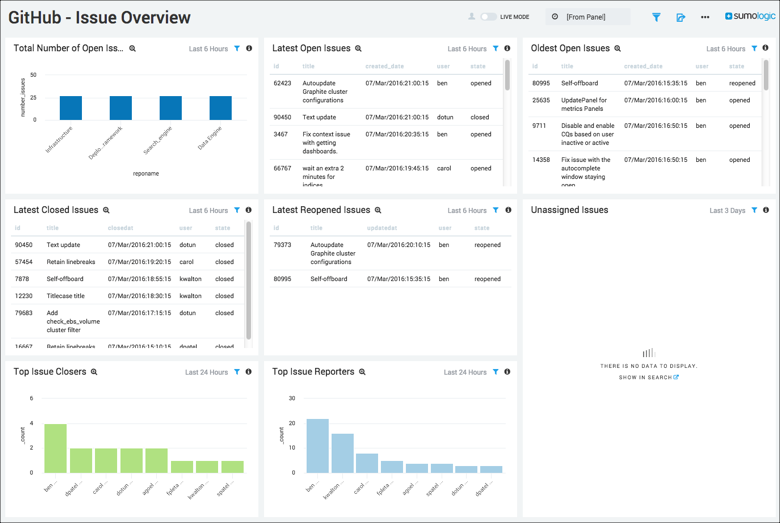 Learn more about how Sumo Logic captures raw data and turns it into meaningful, actionable insights.